« Historical Mad Lib – Fun at Parties – Downloadable Copy! The Apple Bee fun will include…. Making the annual Apple Butter! We will use a 30 gallon copper kettle outside over a roaring fire and boil down 15 gallons of sweet apple cider and 3 bushels of apples! This is the main course of our Apple Bee! 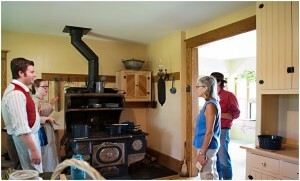 Historic cooking demos in the farm kitchen and tastings too! 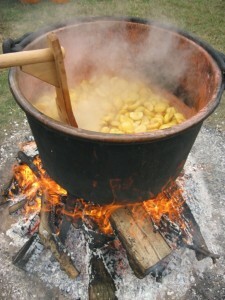 All things apple and historic will be baked, fried and simmered! Lingering in the kitchen is always part of the fun at the Apple Bee! NEW! Hand sewing experience…Please join Jamie Burton, a sewer of all things oldey-timey, for a quick class on the basics of hand sewing. You’ll learn a few basic stitches and even walk away with your own creation: a scented sachet to add color and fragrance to any room in your house or to tuck under your pillow to help you sleep at night (just like the Victorians did!). There is a materials fee of $5 for this add-on opportunity. 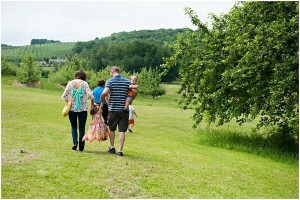 Visit with the farm animals which include, 6 pigs, 8 sheep, a bunch of chickens, ducks, Gypsy the Goose and Champ the horse! My neighbor, Rose Jelinek, is bringing her horse over for the afternoon! And plenty of time for visiting and lollygagging on the porch, in the parlour or thereabouts. I hope you can make it to the Apple Bee! The apples have just been added and now for the big boil! Enjoying the tree swing in the front yard! This entry was posted on Saturday, September 20th, 2014 at 6:51 pm and is filed under Food, Hillside Homestead News, Things to do. You can follow any responses to this entry through the RSS 2.0 feed. Both comments and pings are currently closed.